If you sleep on your side, you may want to invest in a pillow designed specifically for individuals who lie in this position. 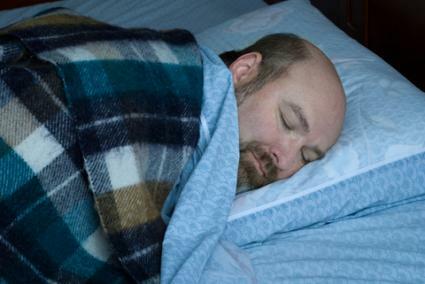 This type of pillow may help people who have some types of sleep disorders. It is a simple option well worth considering and is less invasive than some other sleep aids. Side sleeper pillows are available to meet a variety of specific needs. Aeris Memory Foam Contour Pillow: Available from Amazon for under $50, Aeris designed this queen-size contour pillow for people who sleep on their sides. It has a machine-washable cover and is made from memory foam with ventilation holes to allow air to flow through, a feature that prevents this pillow from getting as warm as occurs with some other memory foam pillows. That may be one reason an Amazon reviewer states, "This pillow does what others promise." The pillow gets high marks from customers on the site, with 85% of reviewers giving it four or five stars. It costs just under $50. Relax The Back ContourSide Pillow: Available from RelaxtheBack.com, the ContourSide Pillow is also made of memory foam and has a washable cover. Its design is slightly different, providing a dual cradle (rather than just one contoured area) - a feature that relieves pressure on the ear and jaw in addition to the others areas positively impacted by a contour design. It also has an airflow system, and customers rate it highly. 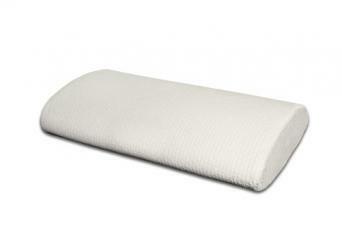 Reviewers on RelaxtheBack.com say they "love" it and describe it as "the best pillow ever." It costs just under $80. Maintaining an appropriate temperature is important to getting a good night's sleep. A number of side sleeper pillows have built-in adaptive temperature-control technology to maximize your comfort in this way, as well as providing proper support and alignment for your body. Iso-Cool Side Sleeper Polyester Pillow: Available from Amazon for just under $60, the Iso-Cool Side Sleeper Polyester Pillow is a great option for side sleepers who prefer a traditional pillow in both design and material. Rather than memory foam, this three-inch pillow has a polyester fill inside a cotton cover. The entire pillow can be cleaned in the washing machine. It is fully hypoallergenic and features "Outlast Adaptive Comfort Technology," which helps keep you cooler while asleep. Reviewers on Amazon indicate these pillows "really do stay cool." Serenity Gel™ Memory Foam Side Sleeper Pillow: If you like memory foam but don't want a contoured pillow, the Serenity Gel™ Memory Foam Side Sleeper Pillow is a good choice. 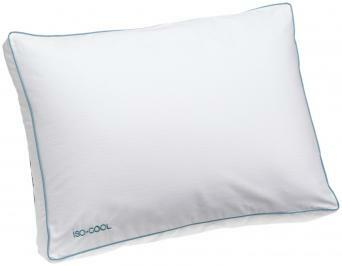 Available from BedInABox.com for just under $90, this pillow features CoolRest® adaptive material (also available in a complete mattress) for maximum comfort. This technology is designed to "effectively balance temperature between the sleeper and the pillow" to help cool you down when you are too warm and provide warmth when you are too cool. Note the cover is not removable, and the pillow cannot be machine-washed. Spot cleaning is the only maintenance option. KneeSleeper Pillow: Available from BeyondBeds.com for just under $85, the KneeSleeper Pillow runs from ankle to mid-thigh. It comes in three different lengths so you can choose a right-sized option for you. For example, the 25-inch pillow would work for people between 5' and 5'6" tall or those who have a 25-inch inseam. Shorter and longer lengths are available for people whose height falls outside that range. The pillow has a built-in "sock" for your leg - that's what keeps it in place while you sleep - and a machine-washable case. Testimonials on the website are positive, with one user indicating this knee pillow works where other styles have failed. SleepyKneez Pillow: The SleepyKneez Pillow is available in standard (about $35) and memory foam (about $70) styles from SleepyKneez.com. 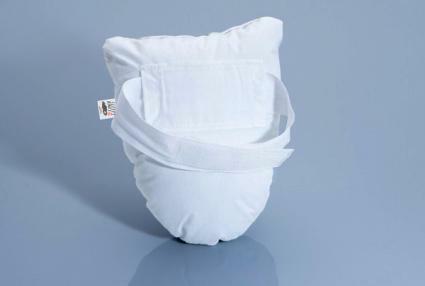 It is a one-size-fits-all pillow, as it is fits directly between your knees without running the length of your legs. It comes with a stretchy band that wraps around your top leg to keep it firmly in place through the night. You will need to specify if you need a small or large band when ordering. Additionally, you can purchase a hot/cold gel pack to insert inside the pillow for around $10. This is particularly useful for side sleepers with knee injuries. Testimonials on the website are positive, with commenters indicating the pillow proves pain relief and stays put. Different styles and designs are available to consider, and there are some benefits and drawbacks to choosing this type of product to improve sleep. These sleep aids can encourage people to sleep on their side rather than on their backs, which can be helpful in alleviating the symptoms of snoring and sleep apnea. In addition, pregnant women can benefit from sleeping on their side during the final stages of their pregnancies. Side pillows may make side sleeping more comfortable in many cases. The variety of products available makes it likely you can find something that appeals to your specific needs. The pillows may not be suitable for everyone. Many are made in just one size and just one design. They may not work well if you tend to move around while asleep, and some designs are specific for right side or left side positions. This can lead to restlessness and possible daytime fatigue. The specialty pillows are more expensive than traditional ones. Choosing the wrong design for your needs can be an unnecessary expense. The pillows may alleviate some symptoms of certain sleep problems, which could make it less likely you would see a doctor about the condition. Is a side sleeping pillow right for you? Consider the pros and cons before making a decision and make certain to discuss any sleep problems with your physician. A pillow may help in some cases, but it is critical you address any underlying medical conditions that may contribute to a sleep disorder.